Textile and Jute Ministry Job Circular 2018 has been published my website All Exam Result BD. 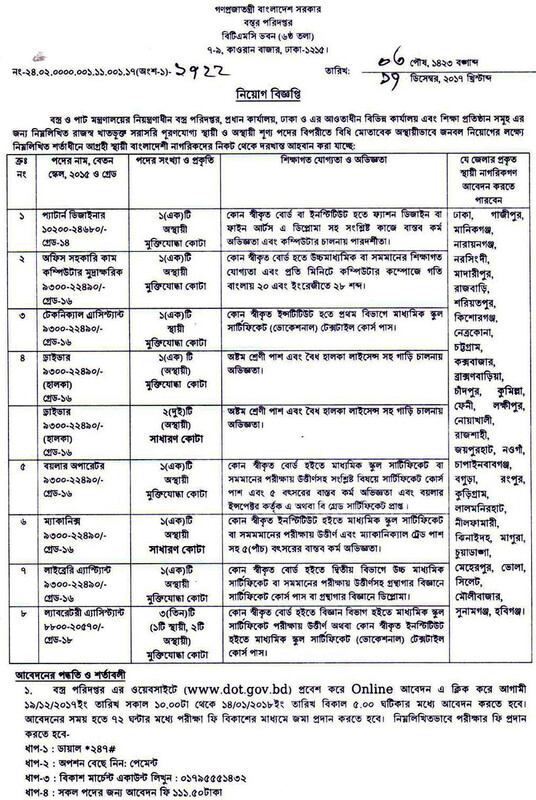 Directorate of Jute attached department under Ministry of Bangladesh Textiles and Jute. Ministry of Textile and Jute is looking for a group of bright, talented energetic fresher offering Inspector Goods, Inspector Jute, Senior Data Entry Operator, Assistant Inspector, Steno Typist, Monitoring Assistant, Computer Operator, Accounts Assistant, Data Entry Operator, Office Assistant, Driver, Night Guard and many more. Directorate Jute Ministry Inspector Job Circular is total post is 252. Directorate of Jute Inspector Job Circular deadline is 14th January, 2018. ■ Job Title: Cashier, Technical Assistant, Inspector, Computer Operator etc. ■Textile and Jute Ministry Job Description: Directorate of Jute Inspector Job Circular has been published. Directorate of Jute attached department under Ministry of Textiles and Jute. Ministry of Textile and Jute is looking for a group of bright, talented energetic fresher offering Inspector. ■ Employment Type: Permanent government job. ■ Compensation and Benefit: As per Govt. Pay Scale. ■ How to Apply: Apply to Director General, Bangladesh Jute Research Institute , Manik Mia Avenue, Dhaka-1207. ■ Age Limit: General Applicant Age Limit 30 years and Freedom Fighter Child Age Limit 32 years.